‍The first course in treating sinusitis is antibiotics. For acute, sinus infections, the treatment may last between 7 to 14 days. If the sinus infection does not resolve with antibiotics, a second stronger antibiotic may be prescribed. 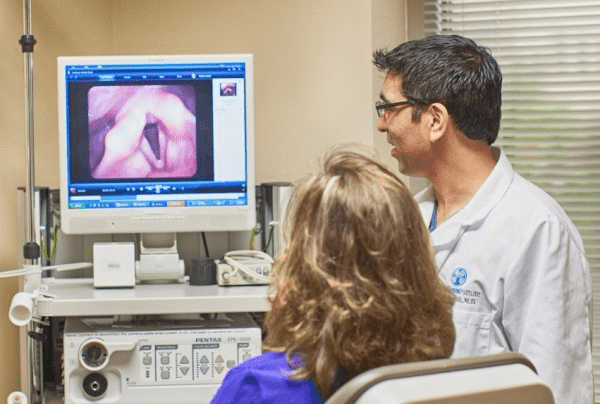 When antibiotics fail to offer relief, the next step may involve a sinus culture obtained with advanced nasal endoscopy techniques in your office visit with the Dallas Sinus Institute. ‍Other medical treatments include nasal steroids, decongestants, mucous thinning agents, and nasal saline irrigations. Common types of nasal irrigation include a nasal device that squeezes solution into the nasal canals, or a nasal irrigation type nozzle called a netti pot. One of the biggest benefits of nasal irrigation is that it may be performed numerous times to provide immediate and long-term relief. Over-the-counter or medicated nasal sprays, including prescription nasal decongestants and steroids, may also be prescribed for sinus relief. Over-the-counter treatments can relieve many types of nasal problems. Nasal saline sprays clear nasal passageways by increasing moisture and reducing thick secretions within the nose. They are not addictive and can be used as much as six times per day. Medicated or prescription nasal sprays clear the nasal canals and decongest the swollen nasal membranes. The relief is almost immediate. They are safe to use for periods of 3-5 days, but regular usage may become addictive. Medicated sprays can also prevent problems with the eustachian tubes when flying in an airplane, as well as reduce the sinus infection that can occur with a cold. They are particularly useful during allergy season to block the release of histamine. Treatment may become wearisome to you if you suffer from Chronic Sinus Infection. You go back and forth to your primary care physician, who prescribes you a medication that works—but only temporarily. Typically, you will be prescribed antibiotics and steroid sprays, but the symptoms will just keep coming back. Until now, the only effective surgical procedure to treat Chronic Sinus Infection was called Functional Endoscopic Sinus Surgery, a procedure that involved using tools to remove bone and tissue in the nose to allow fluids in the sinus cavity to drain. Fortunately, a less-invasive technology is now available. In this procedure, called, Balloon Sinuplasty, a balloon catheter is delivered to the blocked passageway and is gently inflated to widen the opening of the nasal passage, allowing fluid to drain, and giving you relief from pain and pressure.